Hard times can happen in a second to anyone. In 2008, millions of Americans who believed they where on a solid ground financially found themselves out of work. Millions lost their homes and cars. As a result, I’m one of those people who do not take life for granted. I’m always worried about money and security. I have been blessed, complete strangers have helped me during my darkest hours and I’m committed to play it forward. However, you can’t help everyone. 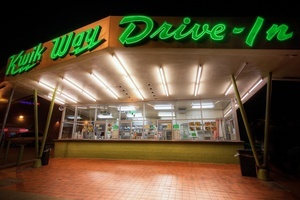 Kwik Way Hamburgers was a local chain in Oakland. Known for their fresh fries and Apple Pies made with fresh apples on site.It was one of those places where you got a lot for a little. One day, I visited their downtown location for their special. Two cheeseburgers small fries and a coke. At Kwik Way, small fries was like a half a bag of freshly cut fries. I offered to buy him food. I told him I was going to order another special. He looked at me and said “his mouth was set on the prawn dinner”(The most expensive item on the menu). Heads spun around in disbelief as he declined my offer. He returned to asking new arrivals for food as they drove up. I wasn’t insulted, he just has a selective palate. This entry was posted in homeless, Living Here, Uncategorized and tagged Economy, Kwik Way Hamburgers, Oakland California. Bookmark the permalink.